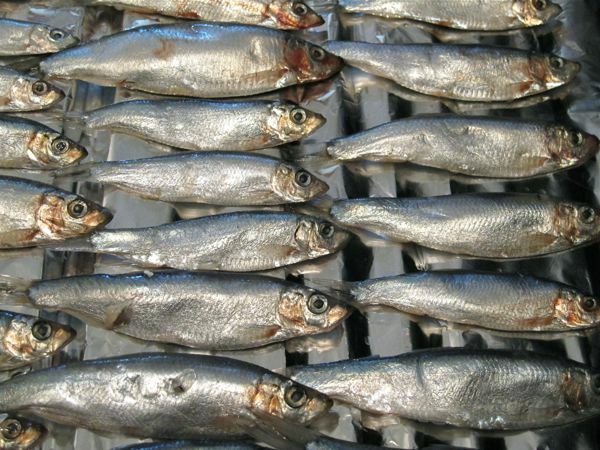 Start by giving your sprats a rinse. A good fishmonger like Dagons will sell you nice clean fresh fish, but as you’re eating these whole, it never hurts to be sure. Dry them well and snip out the innards with a pair of scissors. Slightly time consuming, but very easy. Then grill them under a high heat for 2-3 minutes each side or until the skin is crisp. Escovitch usually uses fried fish but small ones like this are fiddly to fry. Set the fish to one side and squeeze the lime and sprinkle some salt over them. Slice all your vegetables into thin slices, including the scotch bonnet. Handle this with care (or at least latex gloves) and decide how hot you want the escovitch to be. Remove the seeds and pith carefully if you only want a mild buzz but leave them on if you like it spicier. Place the vinegar, sugar, thyme and the allspice in a pan and heat gently, adding in the sliced vegetables and cook for 3-5 minutes or until they soften slightly, but are still fresh and a little bit crunchy. Then pour the vinegar mixture and vegetables over the cooked fish. You may not need all the vinegar so pour carefully. Allow to marinade for at least an hour but as long as overnight. I think it’s best to make it at lunchtime to eat for dinner. Marinading it means the flavours have time to develop and the vinegar mellows from just being sharp to a well rounded selection of piquancy and spice that really works well with the oily fish. Serve with avocado and bread of your choice and enjoy some thing fresh and cleansing while you’re waiting for spring to actually arrive! PS: if you don’t get a chance to make these, then call in at Etta’s Seafood Kitchen and sample her version!